Today is my last day of work. Sigh. It’s actually very bittersweet. It’s been a pretty up-and-down 2 years and 3 months at this job, but I will really miss the patients and some of my co-workers. I looooove working in psych and I looooove working in a hospital. Alas, upon arriving in Washington State, I’ll be working in an entirely different area of social work. But it’s a new adventure, so I’m ok with that. 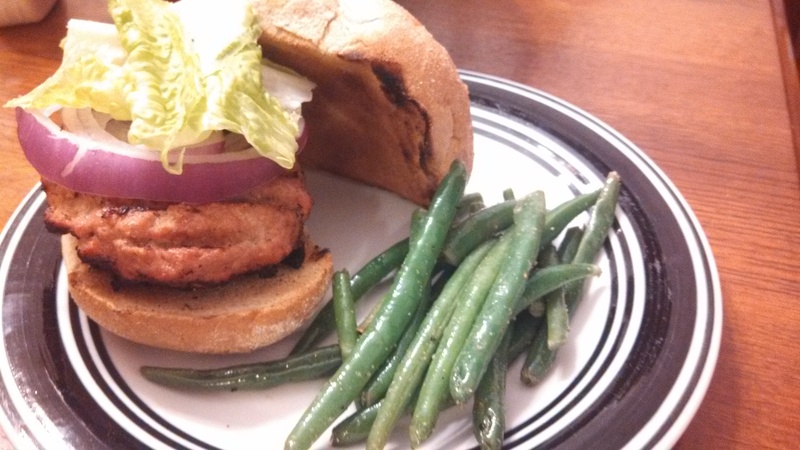 Last weekend, we had some friends over for dinner and I made these super yummy goat cheese stuffed turkey burgers by True Food Cooking and grilled green beans by Coupon Closet. 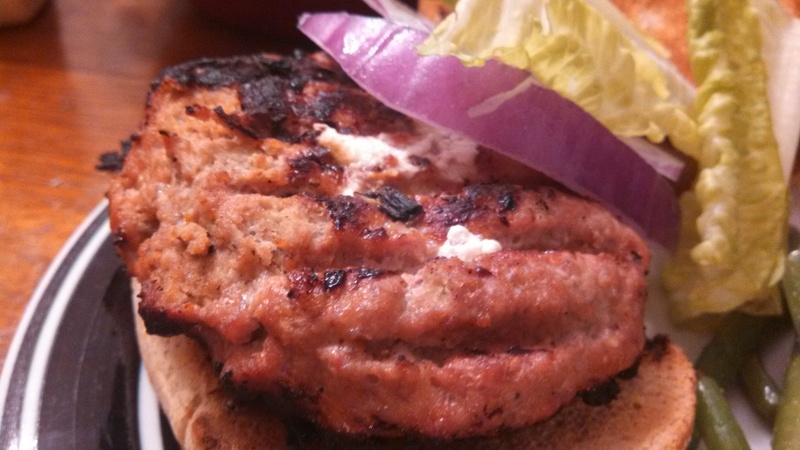 The turkey burgers were great, the flavour of the marinade helps them from being dried out and boring. Moreover, the goat cheese was a phenomenal addition!! Goat cheese melts so nicely, and some of it was oozing out of the burgers when they were done, which was extra yummy. I have made cheese-stuffed turkey burgers two other times (using brie and blue cheese)…it’s definitely a good idea! Also, the grilled green beans were great, too. They were simple to just throw together and toss on the grill. They were a nice crisp-tender and everyone gobbled them up. -Combine turkey, egg, scallions, breadcrumbs, BBQ sauce, dijon mustard, Worcestershire sauce, pepper, salt, and garlic in a large bowl. -Divide into four equal sized patties. -Divide the goat cheese (mine were goat cheese crumbles) and place in the center of each patty. Re-fold the turkey patties so that the cheese is on the inside. -Grill for about 5-6 minutes per side until cooked through. -Serve on buns with desired toppings. -Place them on a sheet of foil. -Add olive oil (or non stick spray) and season with Salt and pepper. -Fold into a foil pack. -Cook for 5 minutes on each side on direct flames.